Kerala is on the southernmost tip of India popularly known as ‘God’s Own Country’. This land offers greenery from the majestic heights of western Ghats with its exotic hill stations, undulating west ward to endless miles of placid back waters, whispering green coconut corridors long shore line, golden beaches with hot sunshine and warm sea, enchanting art forms, historic and cultural monuments. Upon arrival at Cochin, meet and greet at the airport by our representative who will get transfer to the hotel for check-in for overnight stay. Cochin: Also known as Kochi and famous as the queen of Arabian Sea, is a part of Ernakulam district and located on the south-west coast of India. It is the largest cities in Kerala. The Arabs, Chinese, British, Portuguese and Dutch have left lasting signs on the development and history of this emerging city as the industrial and commercial capital of Kerala. Cochin is the natural created by the famed underwater Malabar mud-banks whose quality ensures that the rougher the seas are outside, calmer the waters are within the Harbour. Vasco-de-Gama placed it on the world map. It has a Jewish synagogue, Portuguese churches, mosques and Hindu temples, the Chinese Fishing Nets etc. After breakfast, proceed for sightseeing tour of cochin including. The Hill Palace Museum, a fully-fledged archeological museum and Kerala’s first ever Heritage Museum are the main attractions (closed on Mondays). Chinese Fishing Nets, this unique style of huge cantilevered fishing nets were erected between 1350 and 1450 AD by traders from the Court of Kubla Khan, a Chinese King. Santa Cruz Basilica, this historic church was built by the Portuguese and elevated to a Cathedral by Pope Paul IV in 1558. Pope John Paul II proclaimed the Church a Basilica in 1984. Inside Fort Cochin - The Jewish Synagogue, constructed in 1568, this is theoldest Synagogue in the Commonwealth (closed on Saturdays & Jewish Holidays). The area around the Synagogue, called Jew Town, is the centre for Spice & Handicraft shops. Mattanchery Palace (Dutch Palace), built by the Portuguese in 1557 and presented to the Regent of Kochi (closed on Fridays. Evening Witness Kathakali the famous dance drama of kerala. This dance is characterised by some great story telling, amazing costumes and extensive make-up. Start early to see the artist preparing themselves for the show (5 PM ). Watch in detail the ritual worth seeing hour long process of make-up as part of our daily KATHAKALI performance. After the Performance, you will have a unique opportunity to take photographs along with the artists in colorful costumes as a souvenir. Overnight at Cochin. After breakfast leave for Munnar (05 hrs approx drive), arrive & check-in to hotel. Munnar: Breathtakingly beautiful - a heaven of peace and tranquility - the idyllic tourist destination in God's own country. Munnar is situated at the confluence of three mountain streams - Mudrapuzha, Nallathani & Kundala. 1600 meter above sea level this hill station was once "The summer resort" of the erstwhile British Government in South India. After breakfast leave for sightseeing tour of Munnar. Munnar is a beautiful hill station and is worth visiting, not just for unwinding and complete relaxation, but also for the various tourist attractions in Munnar. Anaimudi Peak - While in Munnar, visit the Anaimudi Peak, which is considered to be the highest peak in southern India. One can set up tents for camping and trekking at an altitude of about 2700 meters and enjoy the tranquil mountain atmosphere. It is a feast for nature lovers and enthusiasts. This peak provides the ultimate high and holiday experience. Echo Point - Echo point gets its name from the natural occurrence of echo here. It is a popular place in Munnar and many people come here to listen to their echoes. It is said that if you can hear your echo calling back at you three times, it is a sign of good luck. Overnights stay at hotel. After breakfast leave for Periyar (03 hrs approx drive), arrive & check in to the hotel. Later visit the Periyar national Park. Watching the rare and endangered species of the animals such as Asian elephants, barking deer, gaur, sambar, wild dogs and strolling in their herds, provides you the most enchanting experience of the lifetime. Apart from exploring the different species of plants and animals you can also enjoy wildlife photography. Overnight stay at the hotel. In the morning after breakfast drive (03 hrs approx drive) to Kumarakom & check-into hotel. Today you will be engaged in lot of adventure activities such as boating, fishing and birding. Later in the day make a visit to the Kumarakom Bird Sanctuary that is home to cormorants, teals, darters (snake birds), night herons, egrets, and Siberian storks many other species of ducks. You may also spot here golden backed woodpecker, crow pheasant, white-breasted water hen, tree pie etc. Overnight stay at the hotel. Morning start heading towards Kottayam. 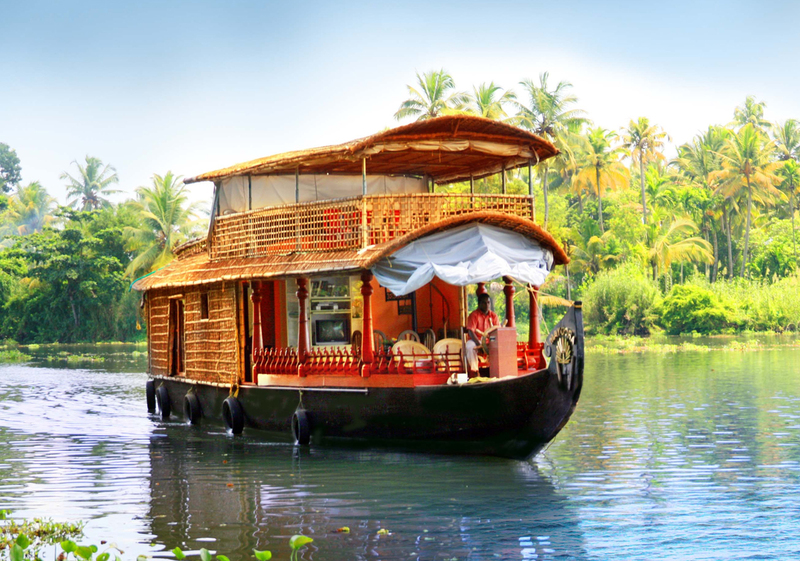 After arriving at Kottayam, board the beautifully decorated houseboat to Alleppey. Aleeppey: The coastal town of Alleppey on the Arabian Sea is the Venice of the east, for the numerous canals that meander through the town. Bathing in the backwaters on the Vemband Lake is refreshing. This town holds a thrilling event of snake-boat race every year in August. It is also known for its cashew nuts, coir trade, rice pepper crops & coconuts. After breakfast leave for Kovalam (04 hrs drive approx), located in south of Trivandrum. Kovalam: Kovalam is one of the most beautiful beaches of the world. The surf here is ideal for surf-riding and the water invites the visitor to ride the Catamaran or Log, with the fisherman, or to take a cool swim. Nearby is the Beach Centre of aquatic sports. At the yoga and health centre, Yoga classes and transcendental meditation are held. Ayurvedic oil massages and oil bath are given by experts. There are two main beaches at Kovalam, separated by a high cliff. It is finding a new significance in the light of several Ayurvedic salons, recuperation & regeneration resorts which provide a slew of Ayurveda. Upon arrival in Kovalam check-in to the hotel for overnight stay. After breakfast at hotel full day free at leisure. You can go for water sports or Ayurvedic & SPA Therapy. Overnight stay at hotel. This morning after breakfast drive (20 minutes drive approx) to Trivandrum, an ancient city with trading traditions dating back to 1000 BC. Trivandrum: It was a trading post for spices like the rest of ancient Kerala. Here you visit the Padmanabha Swami Temple, dedicated to Lord Vishnu is held sacred by the Hindus from antiquity. 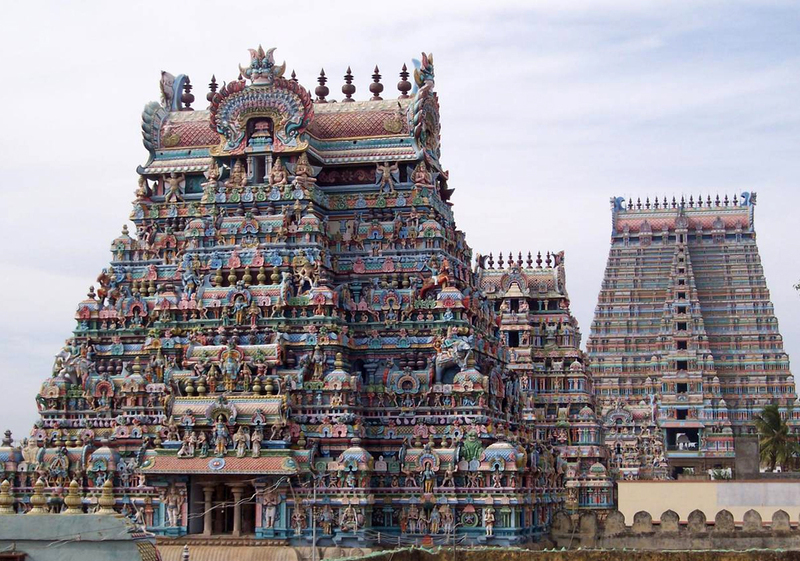 The temple has a large complex with a huge Gopuram. It has a tank beside it for ritual bathing. Later visit Sri Chittira Art Gallery, an excellent collection of Indian art with examples from early to modern schools. Paintings by Raja Ravi Varma & works from Mughal & Rajput miniature paintings & Tanjore paintings embellished with semi- precious stones are displayed. In time get transfer to the airport to board on your flight for onwards destination.